Gunmen kidnap wives of Kano politician - BlogIT with OLIVIA!!! 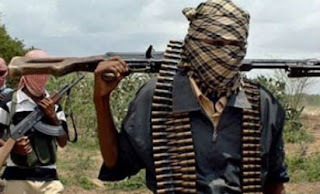 Gunmen suspected to be kidnappers, Monday night, abducted the two wives of Garba Fammar, a Kano politician, in Kibiya, the headquarters of Kibiya Local Government Area of the state. A witness told NAN that the suspects numbering about 40, stormed the residence of the politician around 2am. He said the suspects arrived the town on motorcycles with dangerous weapons. The witness also said that shortly after their arrival, the suspects fired several shots in air to scare people before whisking away with the two women to an unknown destination. Two members of the vigilante group were said to have lost their lives during an encounter with the hoodlums. When contacted Magaji Majiya, police public relations officer (PPRO) of the state police command, confirmed the story. He said the Maigari Dikko, the police commissioner, and some top officers had already visited Kibiya town to access the situation.